Nose: Warm and gentle smoke, nicely embedded in a sweet mix of sherry and dried fruit - mainly apricots and oranges. Creamy with honey, caramell and a floral touch, maybe heather. Round and very appealing. Palate: Intense start on the palate. Pleasantly spicy with a warming mix of oak, cinnamon, caramelised ginger, subtle cloves and nutmeg. Juicy oranges shine through, accompanied by a whiff of heather and subtle wood smoke. Less sweet than one could have expected from the nose. Finish: The finish is medium long, warm and dry with spiced oak, cloves and a whiff of cold smoke. With water: Slightly fresher on the nose when adding a few drops of water. There's more juicy oranges coming through while the wood smoke is almost disappeared. On the palate, however, it becomes quite spicy with lots of dry oak, black pepper, cloves and wood smoke. The pleasant fruity notes of oranges are tamed significantly. The finish shows medium length with very dry and adstringent oak spice and cold smoke. 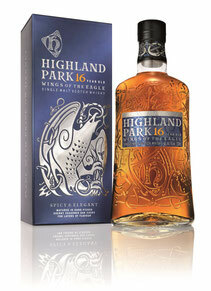 Comments: This 16-year-old Highland Park has wonderful aromas of fruit, creamy honey notes, spices and heather on the nose. All in perfect balance and wrapped in fine wood smoke. On the palate, however, there is a dominant spiciness of oak and pepper, leaving little room for the filgrane fruit aromas to unfold. On the finish dry notes dominate again. A dram for the colder days of the year, but from my point of view there is no need of adding any water. I thank Highland Park for the complimentary sample and the photograph! Nose: Yellow fruits on the nose, such as green apples, apricots, ripe pears with a hint of litschi and a little peach. Notes of vanilla and lemon sorbet emerge, nicely mixed with a touch of oak and a whiff of smoke in the back. Palate: Sweet, fruity, rich and bold on the palate. There's a delicate fruitiness with oranges, lemons, mango and peach interwoven with a warming mix of white pepper, ginger and oak spice. Once the warmth fades, creamy vanilla, honey and yellow fruit jam linger with a touch of smoke towards the finish. Finish: The finish is long, warm and creamy with peach and apple. Becomes drier on the tail with spiced oak, a little nuttiness and a touch of heathery smoke. With water: A few drops of water significantly tame the delicate tropical fruitiness while notes of vanilla and honey emerge. On the palate, this dram is still bold and intense with a decreased fruitiness. There's also less sweetness while prickling oak, ginger spice and white pepper dominate. The finish is medium to long, warm and creamy with vanilla and honey. 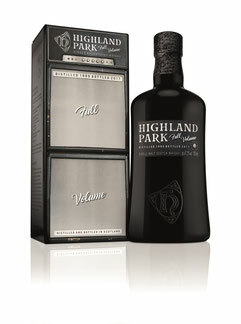 Comments: After Highland Park The Dark this is the second release in the series. This time aged for 17 years exclusively in American oak barrels, the light, tropical fruit notes are dominating here, followed by a creamy vanilla sweetness and a spicy and slightly peppery core. Clearly a very delicate summer whisky with a spicy twist. In direct comparison, however, I prefer The Dark as I simply like the "dark flavours" associated with the European oak more. Nose: Smoke at first on the nose. Not obtrusive, but nicely embedded in a sweet mix of sherry and complex dried fruit - mainly apricots, black berries and raisins. Creamy and spicy with acacia honey, oak, subtle cinnamon and a touch of dark chocolate in the back. Palate: Intense start on the palate. A bit sweet with sherry, barley sugar and dried fruit. Pleasantly warming with a delicate peppery note, cinnamon and cloves. Notes of acacia honey arrive, followed by slightly dry oak spice, black tea and subtle tobacco leaves. This is nicely wrapped in tender smoke. Rich and salivating. Finish: The finish is long, warm and creamy with caramel and bitter oranges. Becomes drier on the tail with spiced oak, pepper, cloves and a touch of smoke. With water: Slightly fresher on the nose when adding a splash of water. There's more vanilla and toffee coming through while the sweetness and fruity notes are tamed. Sweet and creamy, even sticky on the palate with fruit jam and caramel. Then warming with a fairly amount of pepper, oak spice and cloves. Lively with prickling oak on the tongue. The finish is still long and creamy with acacia honey with dry notes of oak and tobacco leaves. Crisp smoke overall. Comments: Maturation in European sherry oak gives Highland Park The Dark a beautiful flavour of dried fruit, sherry sweetness, acacia honey and dark chocolate. After 17 years, nicely balanced with a warming mix of pepper, oak spice and cloves. It is not as sweet as I expected, but the fruity notes are wonderfully complex and everything is nicely wrapped in pleasant smoke. One can spend a long time with this savoury beauty in front of a cosy fireplace. Nose: Fresh on the nose with a fruity start - apricots, hints of pineapple and subtle lemons. Then sweet notes of vanilla arrive, nicely intermingling with cereals (porridge-like), tender herbs and a whiff of tobacco smoke in the back. The alcohol is noticeable but not pungent at all. Palate: Bold and intense on the palate. Starts with a creamy sweetness of vanilla and malted barley, followed by apricots, oranges and lemon zests. Then warming with oak, white pepper, mint, and heather honey in the back. There's a hint of herbs towards the finish, nicely wrapped in tender tobacco smoke. Rich and mouth-coating. Finish: The finish is medium-long, warm and creamy with acacia honey and oranges. Becomes drier on the tail with spiced oak, cloves and a whiff of smoke. With water: Clean and fresh on the nose when a few drops of water are added. There's more citric fruit coming through while vanilla and cereal notes are tamed. More oak spice with a whiff of tobacco smoke in the back. Wow - fairly spicy on the palate with cracked black pepper, oak, tannins and cloves. The delicate sweetness and fruity flavours are almost completely gone while a touch of smoke lingers in the back. The finish is short, slightly warm with creamy vanilla and subtle smoke. No fruits anymore. 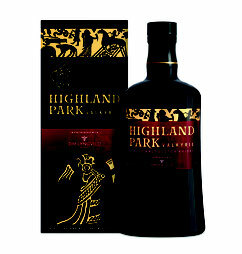 Comments: A completely different, official bottling of Highland Park - without sherry cask maturation. And that's exactly what makes it so interesting for me, because the delicate yellow fruity flavours are very well balanced with the vanilla and cereal sweetness, surrounded by spiced oak and light tobacco smoke. When adding water this dram gradually loses its sweetness and more and more spices from the bourbon barrels come to the fore. A really enjoyable bottling, completely different from HP's usual core range. I thank Highland Park for the sample and the photograph! Nose: Fresh and fruity start on the nose with delicate citrus, green apples and lemon curd. Sweet notes of vanilla and subtle cereals arrive, followed by a hint of white pepper spice and a whiff of restrained smoke in the background. Palate: Sweet and surprisingly spicy on the palate with lingering vanilla and honey, complemented by a warming spiciness of black pepper, subtle oak and cinnamon. Backed up with light peat smoke. The lovely warming spiciness is enhanced with a second sip. Finish: The finish is warming, dry and peppery with just a hint of peat smoke. Short to medium in length. With water: Two drops of water bring more smoke to the fore, while the pleasant fruitiness and subtle oak spice remain. Sweet at first on the palate, followed by a burst of cracked black pepper and wood shavings. Tingling and warming. The finish is short, warming and significantly dry with oaky tannins and a whiff of smoke on the tail. 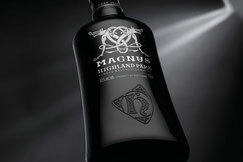 Comments: Magnus is a well-balanced, easy-drinking, relatively lightweight Highland Park single malt. Less pronounced smoke than in the Highland Park 12yo bottling. Not overly complex, but I like the contrast between nose and mouth. While the nose is dominated by freshness and fruitiness, the palate surprises with sweetness and intense spice. An aperitif-style whisky. Nose: The nose starts off with gentle peat smoke, followed by sweet malted barley and a touch of beeswax. Then a delicate fruitiness arrives with apricots, tangerines and lemon curd, accompanied by vanilla and burnt toffee. Heather in the back with a slightly maritime edge. Palate: Pleasantly sweet start on the palate with vanilla, toffee, and honey. This is followed by a warming spiciness of oak, black pepper and subtle cloves. While being wrapped in delicate peat smoke, notes of malted barley, oatcakes and cereals linger with heather towards the finish. Finish: The finish is medium-long, warm and subtle sweet with toffee and honey. Becomes drier on the tail with spiced oak, nutmeg, cloves and a touch of smoke. With water: A few drops of water tame the smokiness while more oak is coming through. The lovely fruitiness remains stable. Significantly spicy on the palate with oak, cracked black pepper, nutmeg and cloves. Less fruity with only a touch of vanilla and smoke. The finish shows medium length with prickling oak and a slightly creamy touch of caramel. Becomes bitter and very dry on the tail. Comments: A well-balanced, spicy sweet and smoky dram. To me, more pronounced smoke than in the Highland Park 12yo bottling. Rich and intense with a perfect drinking strength. Good balance of soft fruits, a lovely malty/vanilla sweetness and hot spices. The palate, however, doesn't deliver all of the delicate flavours the nose promises. Especially the lovely fruitiness. Nevertheless, undoubtedly a well crafted and highly drinkable dram. I thank Highland Park for the photograph! Nose: Bold and intense! Instantly lots of sherry on the nose, mixed with raisins, plums, dark cherries, dried figs and oranges. Caramelised sugar, dark chocolate, almost espresso, and subtle leather with a touch of fragrant smoke in the background. Palate: Rich and strong on the palate with hugely voluptuous sherry. Fruity sweetness of dark cherries, plums and raisins, complemented with a warming spiciness of oak, cinnamon, allspice and a hint of black pepper. Some walnut flavours emerge nicely wrapped in gentle wood smoke. Finish: The finish is medium long, warm and subtle sweet while nutty flavours, dry oak, and notes of balsamic vinegar and liquorice take over. With water: Significantly tamed on the nose with a splash of water. Still lots of sherry, raisins and dates, while notes of dark chocolate and wood smoke are pushed in the background. Rich and creamy sweet on the palate with sherry and oranges, followed by a slightly warming spiciness of cinnamon, white pepper and lots of prickling oak. The finish shows medium length, with a subtle creamy sweetness and dry notes of prickling oak. Comments: This heavily-sherried expression of Highland Park is utterly delicious. It presents the whole range of delicate flavours sherry aficionados expect from a sherry bomb. Rich, intense with the alcohol being well-integrated. 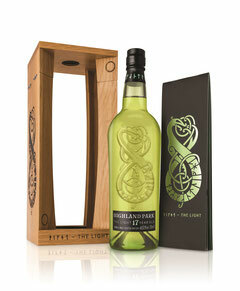 However, Highland Park lovers would entirely miss the distillery character - peat smoke, citric notes and heather, which is completely masked by the sherry. A voluptuous after dinner malt though. Nose: Instantly fresh on the nose with mint, lemon juice and vanilla. Fruity (peach slices and pineapples) with salty toffee and a whiff of menthol. Lingering notes of slightly burnt heather emerge, lovely wrapped in gentle smoke. Palate: Rich, strong and intense on the palate with a significantly warming spiciness of black pepper, caramelised ginger, oak and nutmeg. Once the spicy flavours fade tender fruity elements of peaches, apricots and subtle pineapple arrive, lovely accompanied by a decent note of smoke. Herbal aromas nicely linger with a slightly dry touch of ash towards the finish. Finish: The finish is long and still spicy with pepper, ginger, nutmeg and fine oak. Tender herbal notes, deliciously wrapped in subtle wood smoke with a lingering sweetness of vanilla, heather honey and a touch of salty caramel on the tail. With water: There's more vanilla coming through with a splash of water. Subtle yellow fruits arrive with peaches, apricots and citric flavours, complemented by oak and fine wood smoke. Still very strong on the palate. Peppery with lots of crisp oak and a significantly decreased fruitiness. The finish is long, sweet with acacia honey, yellow fruit and a whiff of smoke on the tail. 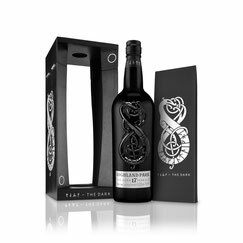 Comments: This is uncompromising, spicy and intense Highland Park showing the lovely heathery profile of the official bottlings. I like the richness but lacks balance as the spiciness is quite dominating the fruitiness of this bottling. Water doesn't really help. Nervertheless, a good whisky though. Nose: Very rich on the nose. A rather sweet maltiness strikes first, with toffee and delicate yellow fruits - gooseberry, apricot and a touch of banana. Then creamy vanilla arrives, followed by touches of spiced oak, cloves, a hint of peat and subtle sweet medicinal character. This is all gently covered by lingering wood smoke. Very appealing! Palate: The palate shows a delicious sweetness with honey, apricots, and banana, immediately followed by bags of black cracked pepper, nutmeg, cloves and allspice. Very warming indeed! Once the spiciness fades, lingering notes of cinnamon, toffee and malted barley emerge, gently lingering with subtle smoke and a slightly maritime edge towards the finish. Finish: The finish is long, sweet with barley sugar, warm and gently spicy. Slightly mouth drying with oak, cloves, subtle peat and a whiff of wood smoke. With water: Creamy on the nose with a wee drop of water. The spiciness almost vanishes bringing more sweetness and fruitiness to the fore, with only a hint of smoke. The spiciness on the palate is tamed significantly, however, there's still a pleasant warmth noticeable in the mouth. A nice mix of fruit, cinnamon, malted barley, vanilla and cloves lingers towards the finish. The finish is a bit shorter with creamy honey, barley sugar and subtle spiced oak. Comments: A great upper of a dram. Charming, enticing, and utterly delicious. The refill hogshead works pretty well here leading to a complex and well-balanced single malt without masking too much of the peat smoke and maritime character. Best enjoyed neat or with a dash of water after a good meal. Nose: The nose starts off with rich notes of honey, sweet malted barley, beeswax and leather. Flavours of cereals and orange zest emerge, nicely wrapped in gentle wood smoke, with a slightly maritime edge. Palate: Pleasantly sweet on the palate with ripe yellow fruit, mango in particular, and barley sugar, immediately followed by a short but intensive and warming spiciness of oak, cracked black pepper and a hint of cloves. A lovely honey sweetness arrives, intermingling nicely with creamy malty flavours and slightly bitter orange peel. This is all wrapped in delicate wood smoke with a soft touch of cloves in the back. Finish: The finish is medium long with a delicate sweetness of malted barley. Pleasantly spicy with pepper, cloves and oak. Warming, with a whiff of wood smoke on the tail. With water: Water enhances the fruitiness on the nose with apples, apricots and mangos coming to the fore. Very sweet on the palate with lots of ripe yellow fruit, creamy barley sugar and a short kick of warming spices. The finish is medium long, warm and slightly drying with a soft fruity touch. Comments: A very nice, creamy sweet and slightly smoky dram. Only 8 years old, but already well balanced with delicate fruity flavours, an impressive sweetness and a hot spiciness as a perfect counterpart. Rich and intense for just only 40% abv. 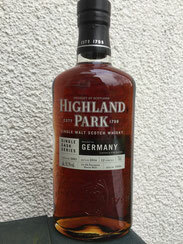 Very good indeed as a sweet, creamy, and delicate interpretation of Highland Park. I thank Whisky Mobil HV Jens Heiler for the sample! Nose: There's gentle peat smoke on the nose with a delicate note of smouldering wood, complemented by pleasant fruit - green apples, apricots and peaches. Sweet flavours emerge with malted barley, fine vanilla and subtle butterscotch. A very pleasant nose! Palate: Sweet barley sugar at the beginning, immediately followed by loads of hot spice - cracked pepper, oak and cardamom in particular. Delicate gentle peat smoke mingles with rich notes of stewed fruit - apricot, yellow plum and peach. Soft vanilla with subtle bitter orange peel and a sweet note of malted barley linger towards the finish. Finish: A long, barley sweet and warm finish, with sticky dark honey and a soft touch of burnt oak and cold smoke on the tail. With water: There's not too much change on the nose with a splash of water. Smoke and fruit remain in nice balance. 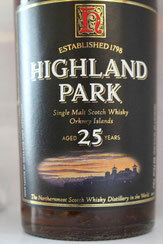 There's more grainy and malty character on the palate with lingering fruit and soft peat smoke. The finish is medium long with barley sugar and delicate smoke on the tail. Very pleasant. Comments: A lovely and nicely sweetish bottling. Concentrated and delicious with a full basket of ripe summer fruit, balanced by lingering peat smoke and elegant spice. A very pleasant dram indeed. The price, however, doesn't please me at all. I thank the German importer Whiskymax for sample and photograph! Nose: Very complex on the nose. Warm, notably flowery with masses of sweet dried fruit. Lingering heathery smoke and heather honey with subtle sherry. Hints of eucalyptus are coming through along with cinnamon, vanilla, a whiff of tobacco leaves, moist earth, dark chocolate, hazelnuts and salted butter. Very aromatic and appetising - an enormous nose. Fabulous. Palate: Huge and rich, beautifully sweet with concentrated fruit sugars, orange peel, hints of vanilla with lingering old but sweet sherry. Leather and tobacco flavours come through along with marzipan, dark chocolate, nuts and heather honey. Delicious spice, cinnamon and nutmeg anchored with a delicate breeze of smoke. A massive mouthfeel. Finish: Warm with a good length. Sweet with toffee and honey. Gets drier with orange peel, walnuts and fragrant smoke. Very enjoyable. With water: The whisky opens up, becomes voluminous, stays sweet with an increased spiciness. Smoke emerges and takes the upper hand in time. Comments: A malt with perfect quality - the distillery character is still there. A brilliant dram with a very complex flavour profile. Optimal balance of aroma and alcohol, perfectly integrated. A masterpiece. 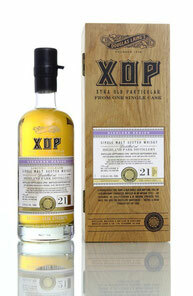 If there is a list of whiskies you have to try before you die, this one MUST be on it!